DIRECTIONS: This family cemetery is located on John Brown Road, .7 miles south of the intersection with Rte. 73. This cemetery was transcribed and photographed by Joyce M. Ranieri on September 4, 2004. 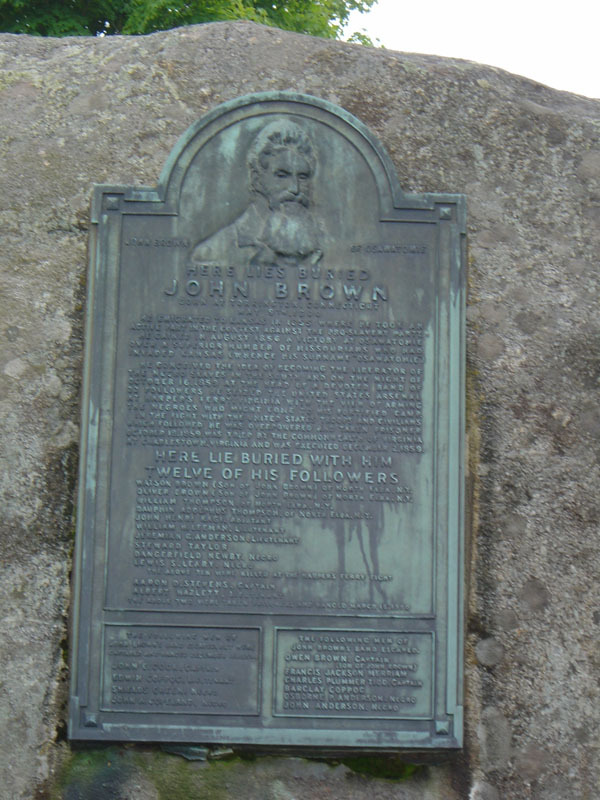 Click here to see general photographs of the John Brown Farm and Cemetery. Click here to visit the official web site for the John Brown Farm. It is believed that twelve men are buried in the three graves inside this fence. 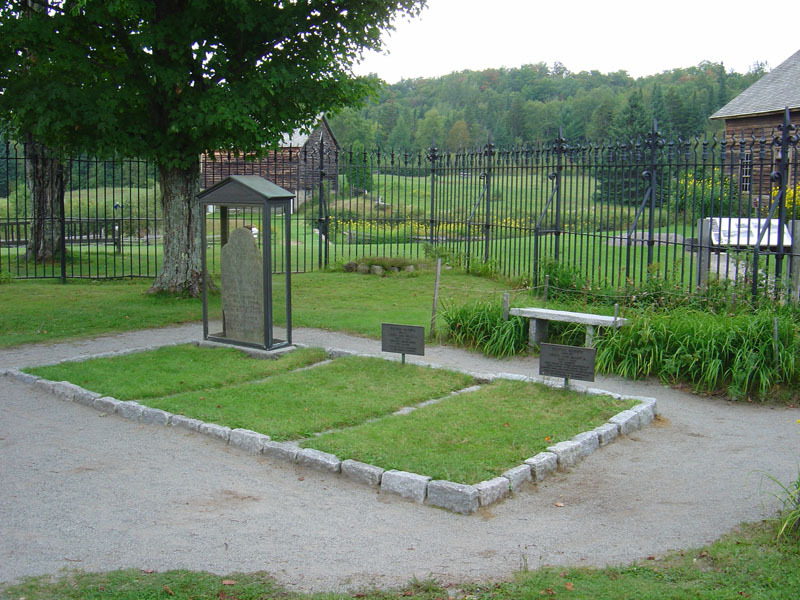 On December 8, 1859, six days after he was hanged for leading the raid on Harper's Ferry, John Brown was buried here on his farm. The glass-enclosed headstone marks his grave. His son, Watson, killed during the fighting at Harper's Ferry and whose body was later used for study at a Virginia medical college, was buried in the center grave in 1882. 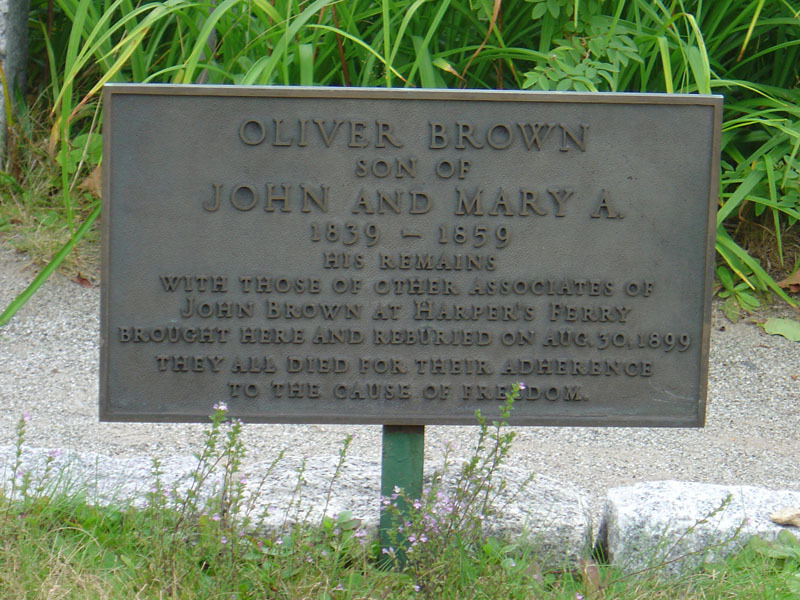 In the third grave are the remains of Oliver Brown, another son killed at Harper's Ferry, and what are believed to be nine other men who took part in the raid. Oliver and probably seven other men lay in a shallow unmarked grave near Harper's Ferry for almost forty years, until they were exhumed and sent to North Elba. On August 30, 1899, they were reinterred here along with the remains of Aaron D. Stevens and Albert Haazlett, two other raiders who were hanged in March 1860 and originally buried in New Jersey. Note: The plaque on the large rock in the graveyard lists thirteen people buried here. However, the body of Jeremiah Anderson was, like Watson Brown's, used for anatomical study and his final burial place is unknown. 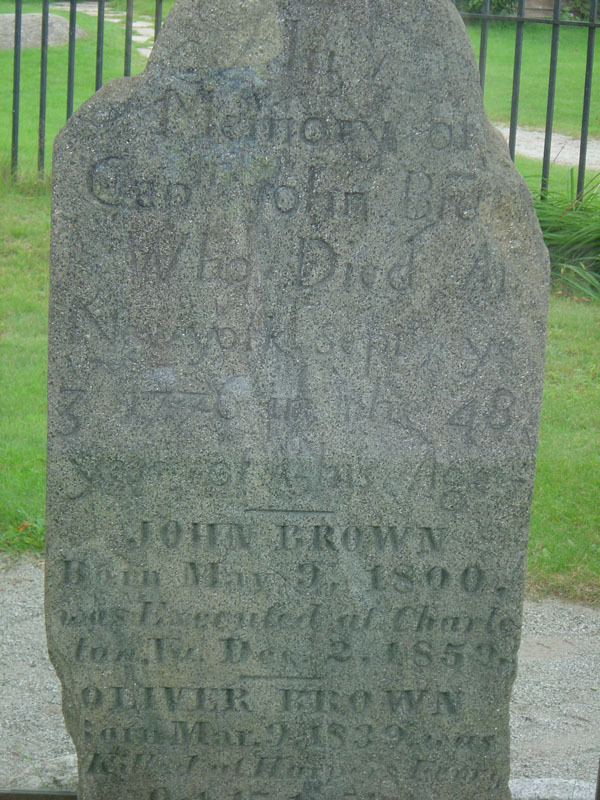 The headstone over John Brown's grave has five names inscribed on it. 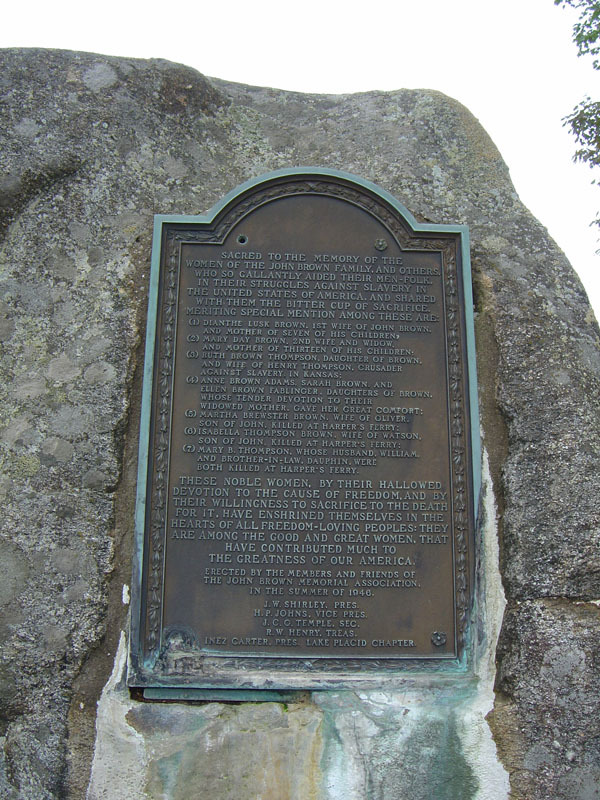 It was originally carved in memory of his grandfather, Captain John Brown, who died September 5, 1776, while serving in the Continental Army. 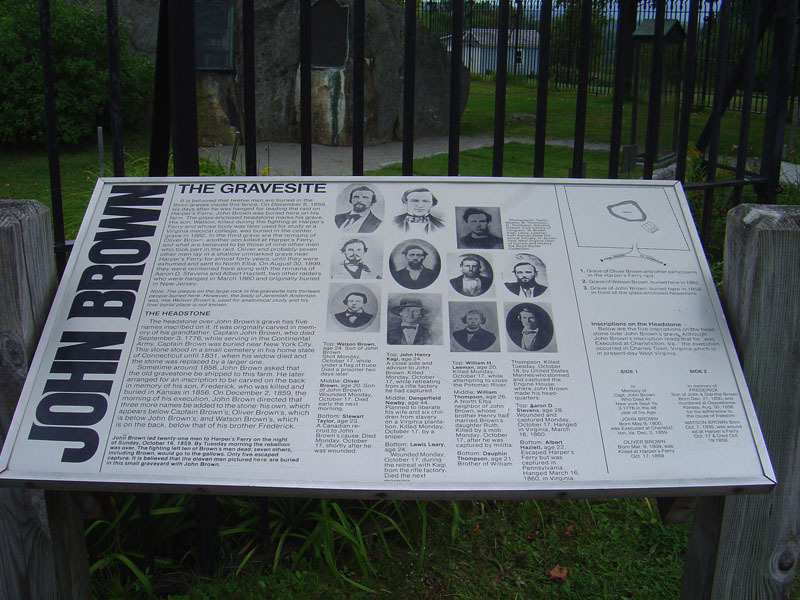 Captain Brown was buried near New York City. 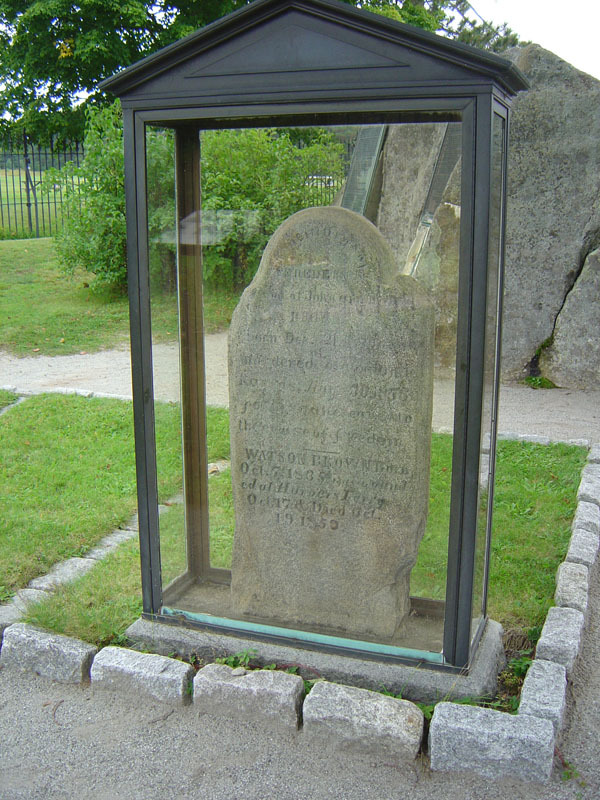 This stone stood in a small cemetery in his home state of Connecticut until 1831, when his widow died and the stone was replaced with a larger one. 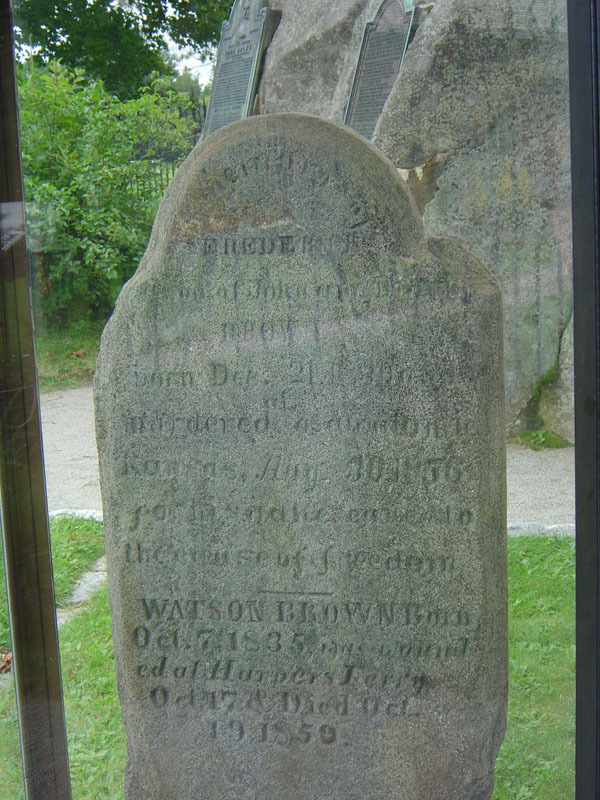 Sometime around 1858, John Brown asked that the old gravestone be shipped to this farm. He later arranged for an inscription to be carved on the back in memory of his son, Frederick, who was killed and buried in Kansas in 1856. 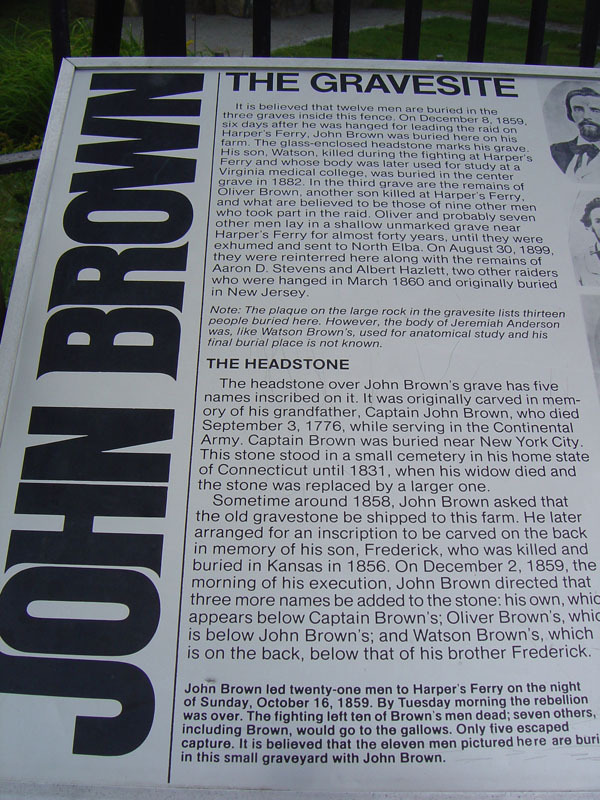 On December 2, 1859, the morning of his execution, John Brown directed that three more names be added to the stone: his own, which appears below Captain Brown's; Oliver Brown's, which is below John Brown's; and Watson Brown's, which is on the back, below that of his brother Frederick. Oct. 17 & Died Oct.
TO THE CAUSE OF FREEDOM. ACTIVE PART IN THE CONTEST AGAINST THE PRO-SLAVERY PARTY. THE NEGROS WHO MIGHT COME TO HIS FORTIFIED CAMP. AT CHARLESTOWN, VIRGINIA AND WAS EXECUTED DECEMBER 2, 1859. 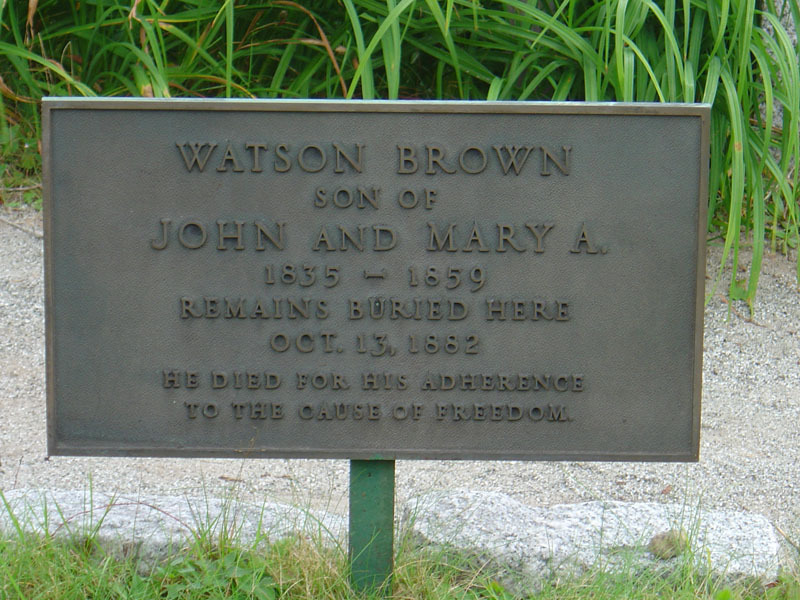 WATSON BROWN (SON OF JOHN BROWN) OF NORTH ELBA, N.Y.
OLIVER BROWN (SON OF JOHN BROWN) OF NORTH ELBA, N.Y.
WILLIAM THOMPSON, OF NORTH ELBA, N.Y.
DAUPHIN ADOLPHUS THOMPSON, OF NORTH ELBA, N.Y. CAPTURED AND HANGED DECEMBER 16, 1859. WITH THEM THE BITTER CUP OF SACRIFICE. AND MOTHER OF THIRTEEN OF HIS CHILDREN. BOTH KILLED AT HARPER'S FERRY. THE GREATNESS OF OUR AMERICA. IN THE SUMMER OF 1946. H. P. JOHNS, VICE PRES. J. C. G. TEMPLE, SEC. INEZ CARTER, PRES. LAKE PLACID CHAPTER.